With the cooler weather comes heartier foods. Hearty does not have to mean rich and unhealthy though. This is a recipe I have been making for many years. I don’t even remember where I found the recipe, it is one that is handwritten in my binder. I have changed it many times from the original so here is my version. I love this recipe. 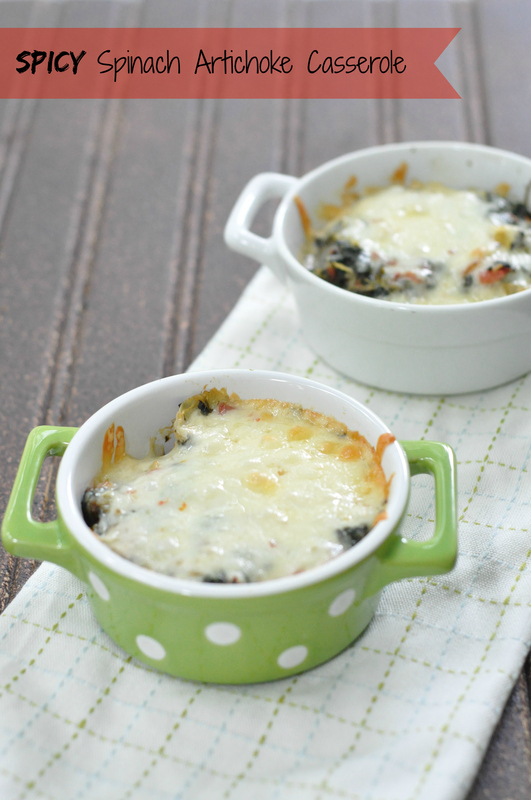 It is so incredibly easy, healthy and family friendly…assuming your kids like spicy food! It isn’t incredibly spicy, but there is indeed some kick to it. Have milk nearby for the kiddos! 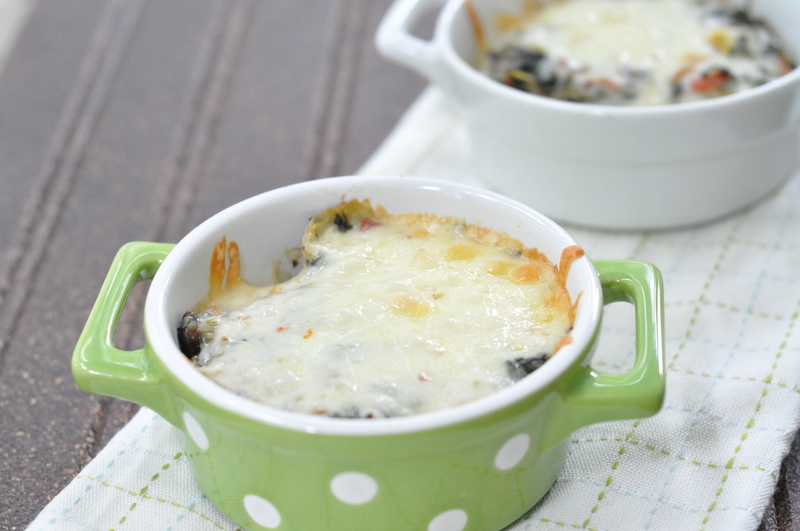 You could call this a healthy spicy twist on the spinach artichoke dip. 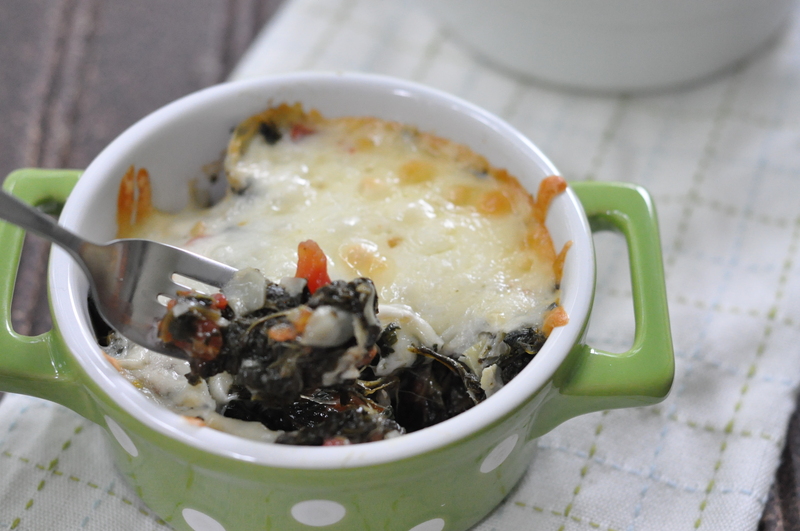 Spicy tomatoes and pepperjack cheese join the spinach artichoke party and create a flavorful vegetable casserole. We enjoy this all fall and winter. It is a crowd pleaser at Thanksgiving and dinner parties, just double or triple the recipe. 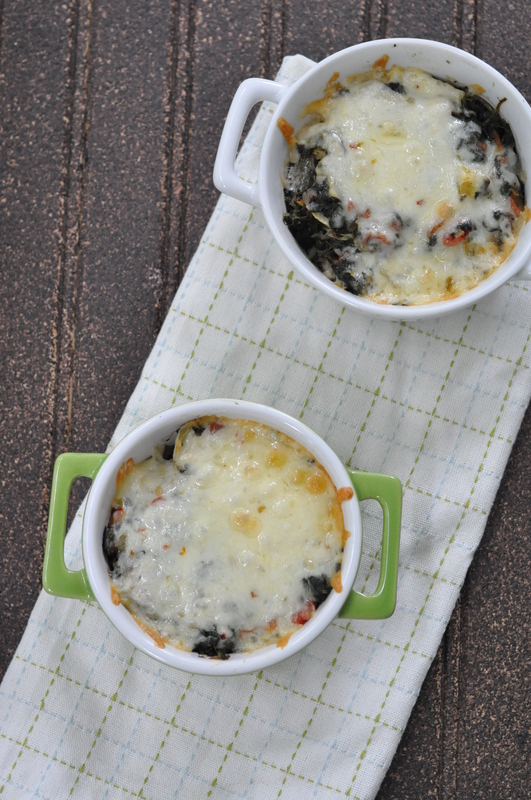 Preheat oven to 350 degrees and lightly grease four individual ramekins or gratin pans (or use one small casserole dish). Drain the spinach of any excess liquid. Heat the olive oil in a skillet and sauté the onions until tender. Add the garlic and sauté for another minute. Add the tomatoes and cook until there is hardly any liquid left, about two minutes. Add everything else but the cheese. Stir well and place in the four pans. Top each pan with shredded cheese and bake for 25-30 minutes, until the cheese is browning and everything is bubbly. This looks delicious. I love the spicy heat from green chiles! You could even serve this with chips at a party. Very healthy and hearty for the Autumn months, Gretchen! It would definitely be good with tortilla chips, just keep a little of the tomato liquid. Spicy is always yummy! Perfect for a Tex-Mex dinner! I am getting hungry now just thinking about it! Bring on the chips! And a nice cold beverage! Oh wow! I have got to try this! Absolutely delicious sounding! Thanks! We certainly all enjoy it. I love make ahead meals. It is great to be able to make something while the kids are at school and focus on them when they get home. I am glad it isn’t too cool here though. Bring on the chili and meatloaf weather! Thanks! It would also make a good dip, but I prefer it as a casserole. Maybe because I could eat so much! Less guilt on its own than with chips! We are freezing here…last night it was 40F. I have my hoody on right now. This recipes looks and sounds simple. I love the cheese, tomato and kick of pepper. Thanks for sharing. The green ramekin dish is a winner. I love that colour! We are “freezing” in the low 60s! We were in the mountains over the weekend and the boys wanted a fire in the fireplace, lows of about 55!! Of course that may have been so they could roast marshmallows!! Thank you! It is always nice to have healthy and easy recipes, especially when cooking with or for kids! I love spicy food too and this looks great! Thank you! Spicy is absolutely wonderful! Especially delicious with the weather cooling off now.